Landing an interview for your dream job (particularly one in fashion) is enough to make even the most confident, fashion-forward among us question every item in our wardrobe. Do I own work-appropriate shoes? Are my tops professional enough? Why don’t I own a pair of pants that aren’t jeans? Even we fashion editors at Who What Wear admit to having had pre-interview outfit nerves. Fashion jobs, in particular, often carry the notion that you need to be fashionable and trendy without trying too hard. We believe that feeling comfortable equals feeling confident, and there are certain key items that can help you feel strong and empowered and keep the focus on your shining skills, talent, and personality. There's certainly no harm in adding a touch of your personal style so you feel like your best self. Anna Wintour advised in a recent interview, “Everyone should remember, whether they're interviewing at Vogue, or indeed anywhere, that we're not hiring your wardrobe. Your wardrobe is not going to be doing the job for you—it's who you are." So I turned to my fellow Who What Wear editors and asked them to share what they wore to their interviews and the thought processes behind them. Scroll below to see what we consider to be a strong fashion-interview outfit formula, and see the looks that got us hired. "Though it was over seven years ago, I still vividly recall my interview to become our co-founder's assistant. I wore a mismatched suit to convey that I was professional but not too uptight for a creative industry. Meanwhile, I was so uptight. Just a 30-minute make-or-break interview for my dream job—no big deal. I styled a navy blazer from Zara with forest-green J.Crew trousers and a vintage white button-down. (Always troll vintage if you’re trying to save money and don't want to look like a fast-fashion mannequin.) I topped off the look with some Lanvin printed ankle-tie heels I scored on eBay and my trusted Marc by Marc Jacobs bag. When money is tight, I find spending on shoes and bags where you can and saving on clothing is the way to go." 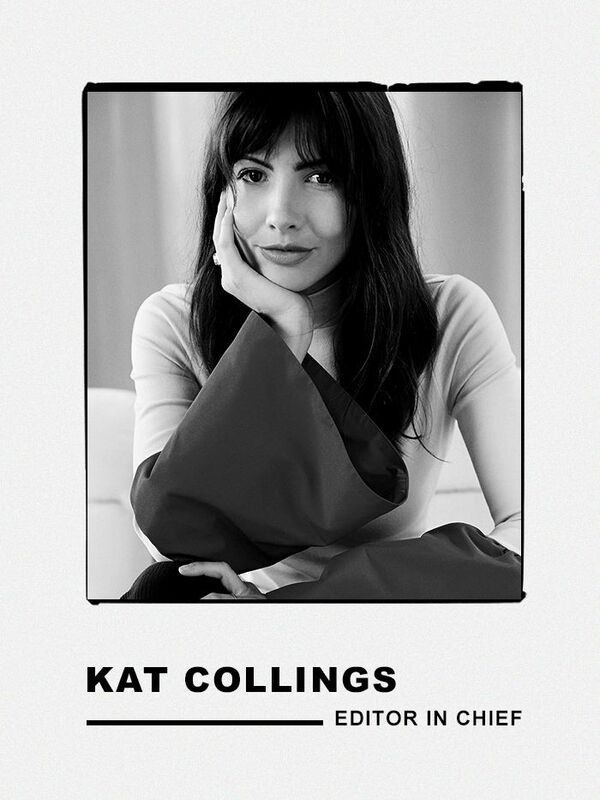 "My first interview was with Kat (now our editor in chief) almost exactly five years ago. I followed her on Instagram already so definitely had an idea of her style and the type of outfit she'd appreciate. I went with high-waisted black pants and a boxy, slightly cropped black-and-white top from Zara (that I still wear to this day). She still remembers that I carried a black Mansur Gavriel bucket bag (back when it was impossible to get your hands on one). And to complete it, red Valentino Rockstud pumps that I was obsessed with at the time." "While interning at Who What Wear over five years ago, my interview for a full-time position actually came as a surprise day-of. Needless to say, I wasn't prepared (in terms of my outfit, at least), so let's just stick with what I would have worn had I been. I think an interview look should be polished and professional but also reflective of your personal style. With that said, I'd probably wear a blazer with a T-shirt underneath, cropped pants, and low-heeled ankle boots." "There's no doubt that I tried on about a zillion outfits the week before my interview at Who What Wear. I previously worked in entertainment, and this was my first foray into the fashion industry, which is where I passionately wanted to be. Needless to say, I definitely wanted to look the part. I couldn't afford much designer at the time, but I did make sure all the pieces I wore were nice quality, looked luxurious, and exuded an effortless elegance. I opted for a cream silk-satin V-neck blouse (which I still wear to this day) and cropped high-waisted black pants from Mango, a camel blazer from J.Crew, and Chanel-esque two-tone comfortable slingback heels. I accessorized with a chic Larsson & Jennings watch and a Tiffany & Co. pendant necklace that I had invested in years back. My outfit definitely skewed on the more classic-and-professional side. Although, if I were interviewing today, I'd probably add a colorful vintage bag and have more fun with accessories." "I technically had two Who What Wear interview outfits: my internship interview back in 2011 and my full-time job interview when I came back in 2015. For the former, I wore a three-quarter-sleeve navy dress with red heels, and for the latter, I wore a pink-and-white striped sheath dress with white heels. To be honest, I don't think I'd wear either outfit in 2019! I think I broke Anna Wintour's rule of buying something new that doesn't represent your style. Now, I'd probably do a fun blazer with a twist and trousers." "When heading into a big meeting, I always want to feel polished and confident. For me, that means the outfit I wore to my interview at Who What Wear—a sleek pencil skirt with a cashmere sweater and slingbacks from Chanel." "When I interviewed with Who What Wear's editor in chief, Kat, it was a few short weeks after graduating from college, so naturally, I didn't have a very interview-ready wardrobe on hand from the get-go. I invested in a pair of tailored black trousers and styled them alongside a few other savvy finds like a pair of vintage kitten-heel mules and a hunter-green blazer from Zara that I still own and wear today. I think it's important that an interview outfit comes off as polished and professional first, even if that means sacrificing a trendier option. My suiting was certainly professional, but I think my choice in shoes allowed it to be a bit more 'fashion.'" "To my interview, I wore a burgundy, textured, mock-neck midi dress with short sleeves; a wool, dark-gray, long vest-overcoat situation that was tailored; with black suede pumps. I remember wanting to be on trend but classic at the same time." Up next, the It-girl way to wear jeans to the office.